In fact, there is hardly anything DaVinci Resolve doesn’t support. However, it doesn’t mean that you can import every piece of video into this world famous color corrector and amazing editor. When it comes to importing MP4 files to DaVinci Resolve, you may find that this editing program fails to recognize or sometimes may crash, which is really a great pain. If you’re having trouble editing MP4 files in DaVinci Resolve 12, 11, 10, etc., read on for details. Why MP4 files won’t work in DaVinci Resolve? The reason is that MP4 is a format container with different codecs which isn’t compatible with Davinci Resolve. According to Davinci Resolve’s offcial site, Resolve does not support MP4 files, or any compressed audio file formats. How can we freely load/import MP4 files in Resolve 9/10/11/12? The answer is change MP4 files to a more editing-friendly format, such a Resolve’s DNxHD .mov. To fix the problem, the easy workaround is to transcode MP4 to a more editing-friendly format, such a DaVinci Resolve’s DNxHD codec. To finish the task, you can use the top Pavtube Video Converter for Mac, the best video converter that can help you transcode any MP4 videos and other MKV/MTS/MXF/AVI/MOV/H.265/FLV to DaVinci Resolve compatible videos with original quality. Besides, this software can also transcode any video files for editing in Windows Movie Maker, Avid Media Composer, Adobe Premiere Pro, Sony Vegas, etc NLEs. Note: If you are running on Windows, please turn to the MP4 to DaVinci Resolve Video Converter (10, 8.1, 8, 7, XP, etc) . Now just download it and follow the steps below to encode your MP4 videos to DaVinci Resolve on Mac. 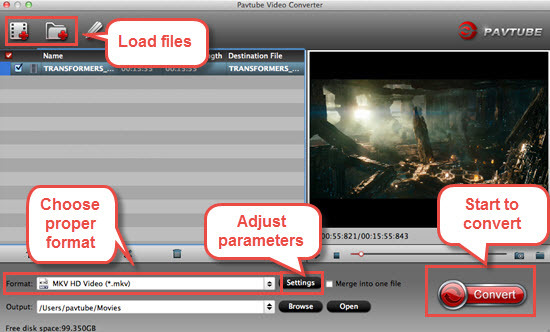 Launch the Pavtube Video Converter for Mac, and you may either click “Add video” button to import .mp4 files, or directly drag and drop the files into this program. If you’d like to combine multiple MP4 files to be a single file, you can tick the checkbox “Merge into one file”. Click the “Format” to select output format. Choose “Avid Media Compose > Avid DNxHD(*.mov)” as the Resolve 9/10/11/12 output format for nice importing and editing in Resolve 9/10/11/12. After all the necessary setting have been done, click the “Convert” button at the bottom right corner to start transcoding MP4 to DNxHD .mov. Finally, launch Davinci Resolve. Find the file in the Library panel, and then double click your clip or Right-click and select “Add into Media Pool.” Now the clip is added to your Media Pool. You can also import entire directors or a range of clips into the Media Pool. How to Import converted Video into DaVinci? Follow here. In order to import media from your media storage to the media pool, you have to select the media that you want to upload and then just drag it to the media pool. If you get a pop up message that asks you if you want to change the frame rate of the timeline to the frame rate of your media because they don’t match, you should click on “Change”. By double clicking on a video in the media pool, and pressing the play button you can simply preview the shot. 4. In order to delete a video from the media pool just right click it and press “Remove Selected Clips”. Have a try this powerful tool to transcode your any MP4 videos (camera/iphone/iPad/YouTube etc) to DaVinci Resolve friendly format with three steps for nice editing. Can’t Play MP4 on Apple TV? Solved. How to Convert MP4 to Play on iPhone (iPhone 6/iPhone 6 Plus included)? Can’t Add MP4 videos to iTunes? Solved. 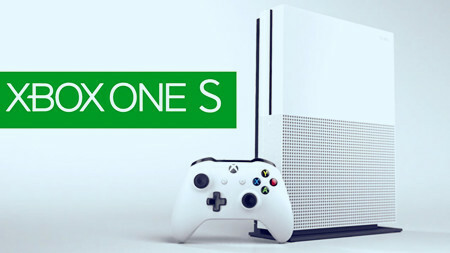 Slimline consoles are nothing new, but Microsoft really mixed things up with its Xbox One S. While the original Xbox One maxed out at 1080p, the new Xbox One S takes it all the way to 2160p, otherwise known as 4K. Thouh Xbox One S supports 4K video playback, it does not support all videos like MP4 video. When playing MP4 on Xbox One S, many people just encounter various problems, such as no audio when playing video, and Xbox One S can’t read some of MP4 files, etc. So if you can’t play your MP4 video, here is no other ways but to convert MP4 to Xbox One S supported MP4 for successfully playback. To help fix Xbox One S MP4 playback issue and watch MP4 on Xbox One S without any problems, Pavtube Video Converter for Mac, the best Xbox One S video converter, is highly recommended to convert any video to the format accepted by Xbox One S, such as convert MP4 to Xbox One S, AVI to Xbox One S, MKV to Xbox One S, WMV to Xbox One S, MOV to Xbox One S, H.265 to Xbox One S etc. Besides, it also can encode MP4 in 4K/HD/SD resolution video to other PS3, PS4, Xbox One, Xbox 360 supported video formats for better playing. Download the MP4 video converter on your computer, install and run the program. Then add .mp4 videos. You can choose to import videos or the entire folder by clicking the top left two icons. 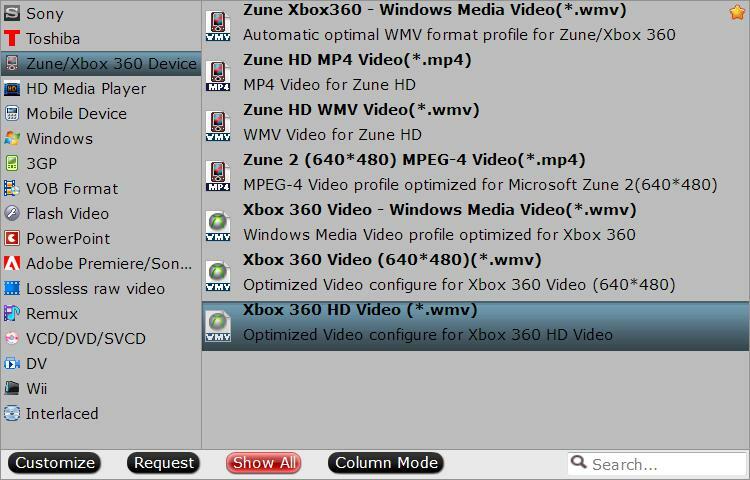 Click on the drop down menu of the Format, select “Zune/Xbox 360 Device”> “Xbox 360 HD Video (*.wmv)” as the target format. It fits on Xbox One S as well. Tip: If the default video/parameters can’t meet your needs, just click Settings icon to adjust the video codec, bitrate, frame rate, audio sample rate, etc to get a decent video as you want. In principle, the larger input values, the better output quality, but the corresponding larger file size. After all necessary settings, you can hit the “Convert” to start converting MP4 to Xbox One S friendly format with best video settings. Once the conversion finished, click “Open” in main interface to quick locate the converted video. Then, you can stream the converted MP4 movies to Xbox One S via DLNA or USB freely. Enjoy! If you are a Windows user, you can get Pavtube Video Converter to convert MP4 to Xbox One S Supported Format on Windows (10). How to Solve “LG TV MP4 Playback” issue? Some iMovie users have the quirement of converting iMovie file to other formats. If convert iMovie file to suitable format for playing on iPhone, iPad, QuickTime, TV etc or editing in Premiere Pro, FCP etc, you can convert your iMovie file to their supported bet format for smooth playing, editing and other usages. Looking at the many features that Pavtube Video Converter for Mac comes with, it will give you confidence that it’s the best solution for converting iMovie format to MP4, MKV, WMV, MOV, H.265 and more popular formats. Some of those that you will find useful include merging multiple files, capturing screenshots, automatic updating of the program, recording of any video, built-in media player and full utilization of the multi-core processor. Another exciting aspect is the high compatibility of the program. It works well with almost all popular formats for both video and audio. Convert iMovie Format to MP4, MKV, WMV, MOV, H.265, MPEG-2 and any formats. Convert MP4, MKV, AVI, XAVC, AVCHD, MXF, H.265 etc to iMovie editable format. Support output format for FCP, Premiere Pro, FCE, iMovie, Apple Aperture 3, Avid Media Composer and more NLEs. Basic video editing functions: split, merge, trim, crop, add watermark, adjust video effect, edit audio and insert subtitles. Customize the output resolutions to any size the users want. Compatible with macOS Sierra, El Capitan Yosemite, Mavericks, Lion. How will you add the files to your program? It’s pretty easy and simple. program and you should add one file at a time. If that is not okay with you, go to the menu bar and click on “File” then select “Load Files”. Either of the options will give you some ease in importing files. Click “Format” bar, and select .mp4, .avi, .mkv, .mov etc from “Common video” or “HD video” according to your needs. Or choose format from iPhone, iPad, PS3, PS4, TV etc. Finalize the conversion process by clicking on the “Convert” button. This will take charge of the whole process so you can go out and take some rest then come back to get the conversion completed. Make sure all the steps are followed strictly. Honestly speaking, it is almost impossible to play YouTube videos on QuickTime directly, because most of the YouTube formats are not supported by this Mac player, even you have installed some basic packages to play YouTube with QuickTime. So how to play YouTube on QuickTime player with a better method? In fact, we can make it with the best YouTube to QuickTime converter. You can use a professional video converter for Mac to convert YouTube video to QuickTime supported MOV video for smooth playing. With Pavtube Video Converter for Mac, you can fast convert any SD/HD/4K FLV, MP4, MKV, MXF, XAVC, WMV, AVI, or any other extension to QuickTime playable format with least quality loss. With this converter, your experience when playing YouTube files on QuickTime will be the best and unrivalled. It will convert to popular formats like H.265, MKV, 3GP, MOV, MP4, AVI, WMV, M2TS, MPEG, TS, MTS, M2TS, MXF in a quick and easy way. Now click the Download button below to get the program. Wide range of formats – works with over 250 audio and video formats to QuickTime MOV and any formats. High Quality conversion – It does not lose quality when it converts video. Custom Video: Personalize videos with diversified video editing tools. For Windows users, turn to Pavtube Video Converter to ensure perfect YouTube video playback. Click “File” button to import YouTube videos which you want to play on QuickTime player, or you could just dragging files into the main interface of this tool. Click format you choose MOV as target format. This video app offers the QuickTime Movie Format for you. 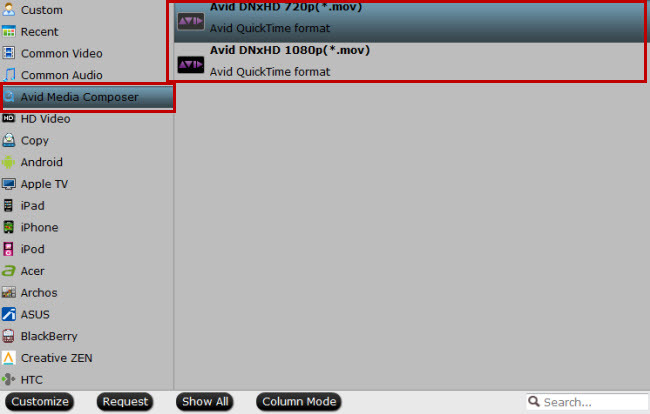 Or, you can also choose “Common Video -> MOV – QuickTime (*.mov)” as the output format. Click “Convert” to convert YouTube FLV file to MOV the compatible file format to QuickTime player. Then click “Open Folder” button to locate the converted YouTube files for better playing. How to Play QuickTime MOV on TV? The new Phantom 4 Pro and DJI Inspire 2 can record 4K H.265 videos. If you have got some 4K H.265 videos from Phantom 4 Pro/DJI Inspire 2, you may want to play them on QuickTime. But H.265 codec is not friendly with QuickTime. So how to play Phantom 4 Pro/DJI Inspire 2 4K H.265 videos on QuickTime player? Read on to get the solution. It’s possible to make Phantom 4 Pro/DJI Inspire 2 4K H.265 files playable in QuickTime as long as you decode H.265/HEVC to QuickTime readable format. To get the work done, you need help from the best H.265 file converter- Pavtube HD Video Converter for Mac. As a professional H.265 converter, it can help users to convert Phantom 4 Pro/DJI Inspire 2 4K H.265 to QuickTime playable MOV, convert H.265 to H.264 MP4 video on Mac (including macOS Sierra) without quality loss. It also can convert AVI, MKV, MP4, MXF, XAVC etc to QuickTime player supported formats for playing. Besides, it also supports converting H.265 files to other common videos including MPEG-4, MPEG-2, DivX, XviD, WMV, MKV, etc to meet your different needs. Plus, if you need, with this program you can fast convert non-H.265 videos to H.265 seamlessly. Download the program to start the H.265 to QuickTime conversion task. 160+ ready presets for iPhone, iPad, QuickTime, Apple TV, Game Console, TV, video editors, etc. Launch the 4K H.265 to QuickTime Converter macOS Sierra. Drag & drop 4K files to the program directly and your files would be added instantaneously. Or you can head to the “Add” button to locate the 4K H.265 videos you want to add. Click “Settings” button; you can adjust video and audio settings, including codec, aspect ratio, bit rate, frame rate, sample rate, and audio channel. To down-convert Phantom 4 Pro/DJI Inspire 2 4K H.265 to 1080p video for easier playback, you just need to adjust video size to 1920*1080. Hit the “Convert” button to let this smart converter start encoding Phantom 4 Pro/DJI Inspire 2 4K H.265 to QuickTime .mov on Mac. When the conversion is done, you can play the converted 4K videos in QuickTime player on macOS Sierra without hassle. How to Edit DJI Phantom 4 Pro 4K H.265 video in Windows Movie Maker?